Since 27.5% of the web is powered by WordPress, you may wonder whether it’s the right platform for your photography site. After all, you want your website to stand out from the crowd. The beautiful thing about WordPress, however, is the diversity and customization it offers. With the huge variety of themes and immense selection of plugins and widgets available, you’ll never have to worry that your WordPress-powered photography site is anything other than unique. Below, we’ve provided seven beautifully-designed sites, each of which can offer creative inspiration. They range from portfolios to photo news sites to photoblogs, but they all have one thing in common: WordPress. Art by Amy Paul, a photo website made up largely of galleries, is a perfect showcase of our very own Emporia theme. It’s also serves as a wonderful inspiration for freelance creatives. This streamlined and minimalist site enables the photographer to showcase their work in a clean manner, while providing visitors with a visually-appealing experience. If there’s one idea to take away from this site, it’s definitely the clean display that makes the artwork the overall focus. Slideshows and galleries: Both are an excellent way to showcase quality work. Customizable headers, menus, and backgrounds: These features can incorporate brand-specific images, logos, and more. Mobile responsiveness: Mobile menus and full-image displays bring the experience alive for mobile users. Our Stock Photography theme, used for Daniel Burgas Photography, is a stellar way to transform any website into a stock photography powerhouse while ensuring user-friendliness. This site’s impressive look is achieved through a variety of features, including an extra-large header area and a perfectly-aligned collections section. Also, the menu settings and tag cloud make site navigation easy – which is something all creatives should keep in mind when building their own sites. Advanced search: You can search images by keyword, file type, license type, and even price range. Unlimited collections and galleries: This allows you to display your photography in a variety of ways, and never run out of space. Topic cloud: Clouds enable site visitors to quickly browse through a collection of image keywords. While the differences between Daniel Burgas Photography and Gen StockPhoto are minor, they showcase the versatility of the Stock Photography theme – and WordPress – very well indeed. Both sites feature prominent search bars, a personalized header image, and collections. That said, Gen StockPhoto’s extensive use of the collections gallery feature really sets it apart. Prominent search bar: This eye-catching feature is fantastically user-friendly – an easy way for visitors to search through collections of stock images. Collections showcase: Images are meant to be seen, and this feature enables optimum exposure. Featured photos: Whether you’re running a stock image site or a photography portfolio, featured photo placement is a must-have. 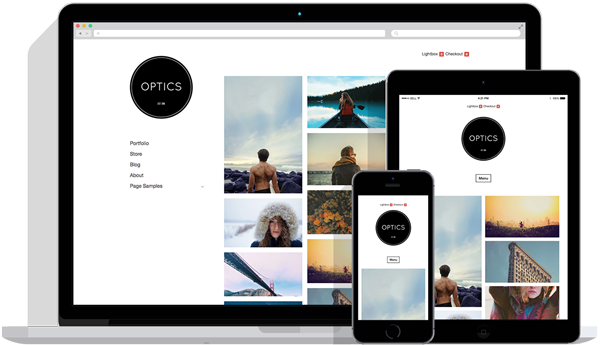 This is another photography website built using one of our themes. Markus Huth takes full advantage of the extensive gallery display options – as well as the custom text alignments and text box displays – available with the Full Frame WordPress theme. This minimalist yet stunning website benefits from the plethora of customization features offered by its theme. If you want your photography to do all the talking on your own site, take your inspiration from Markus Huth. Prominent gallery display: The full-width display and in-your-face gallery placement is ideal for portfolio websites. Custom text alignment: You can custom align text on images, and place them exactly where you’d like throughout your site. Versatile post formats: From standard to image to gallery, versatile formats inspire the creation of unique and diverse posts. A popular photo news site, Peta Pixel uses WordPress’ site-building tools to the fullest. This site, designed to offer photographers the best tips and latest news, still manages to bring photography itself to the forefront with large images integrated throughout the homepage and smart use of white space. To add variety to your own website, take Peta Pixel’s lead and intersperse larger images and displays among smaller or less prominent ones. Prominent social media icon placement: Lead site visitors to your social media profiles with the addition of prominently-placed icons and buttons. Trending posts sidebar: Highlight popular posts and topics with this sidebar feature. Customized article display: Display your posts in a uniform manner, or allow some to stand out more than others. Offering the latest in photography news and tutorials, Photofocus runs on StudioPress’ Genesis Framework. With a large content slideshow placed front and center, as well the ability to display both images and article text snippets in a gallery fashion, Photofocus highlights the versatility of WordPress with its seamless combination of writing and photography. This website is an excellent style example for anyone who wants to make text and images work in tandem on their own site. Featured content slideshow: Using this type of slideshow helps you show off popular content, ensuring that even new visitors can get a taste of what’s trending. Fixed menu: This handy feature enables the menu bar to remain at the top of the webpage, even as site visitors scroll down. Sound cloud integration: Add music playlists and podcasts to your website to increase visitor engagement. Yet another photo news site, Feature Shoot differs significantly from the setup of both Peta Pixel and Photofocus. With a greater emphasis on featured images and a streamlined display, this WordPress-powered site prefers minimalism over busyness and ensures that its images get the majority of your attention. For photographers looking to create their first site, Feature Shoot is an approachable example of how simplicity and white space can highlight your most important content. Favorites slideshow: You can easily bring featured posts and photographs to the forefront of your site this way. Prominent category display: Making site navigation a breeze, this feature enables visitors to easily hop from category to category. If you’re hoping to create a distinctive photography website, WordPress is an ideal platform. It offers more than enough diversity, with its seemingly unlimited selection of theme options, plugins, and widgets. Whether you’re an established freelance photographer, a photo journalist, or an aspiring creative, WordPress provides you with all the necessary customization tools to make a website that’s fully your own. Art by Amy Paul: A photo gallery site that uses galleries and slideshows to their full advantage. Daniel Burgas Photography: A stock photo site with a large header area that highlights beautiful images. Gen StockPhoto: Another stock photo site that demonstrates the benefits of a collections gallery feature. Markus Huth: A full-width gallery site with a simultaneously minimal and impressive aesthetic. Peta Pixel: A photo news blog that seamlessly integrates images throughout its text. Photofocus: Another photo news site with a featured content slideshow that’s ideal for displaying images, blog posts, and more. Feature Shoot: A simple photo site that effortlessly displays beautiful photography and writing without drawing attention to itself. Which of the above photo sites appeals to you most, and why? Let us know in the comments section below! This entry was posted in Blog, Photography, Themes. Bookmark the permalink. Thanks for sharing this awesome post of your favorite photography sites.